Chai is so hot right now, and not just because of Arshad Khan, the moustachioed 18-year-old tea seller with piercing eyes who has been catapulted from a tea stall in an Islamabad flea market to viral stardom and modelling success in Pakistan and beyond. Chai – that deeply soothing ritual with which millions of Indians regularly punctuate their day – is enjoying a wide resurgence at home and abroad where the centuries old recipe (tea flavoured and perfumed by a variable combination of clove, cardamom, ginger and cinnamon) is enjoying a myriad of new forms, be it with the addition of wholesome turmeric or enlivened by a shot of coffee to create what’s called a ‘dirty chai’. The pairing of the latter is an especially natural one when using Nespresso’s Indriya from India Grand Cru, with the chai’s fragrant dry plant notes proving a natural companion for the coffee’s spicy bouquet of clove, pepper and nutmeg. “When pairing desserts with different coffees, you really need to see what compliments the coffee notes and aromas in the coffee itself,” Wedes told GRAZIA. 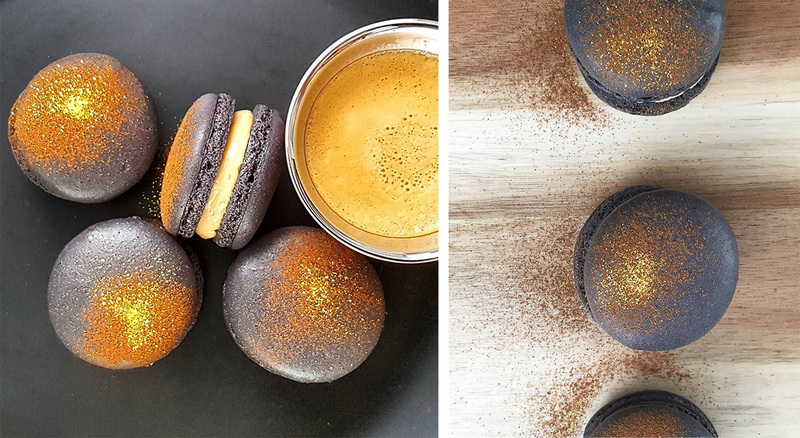 All that’s left to do is dust the Dirty Chai Latte Macarons with cinnamon and gold – a decadent flourish that puts the gilded edge of India on your next 3pm craving. Line two trays with baking paper and macaron stencil and set aside. Process almond meal and powdered sugar in a food processor until blended into a fine powder. Sift the mixture into a large mixing bowl and set aside. Combine eggs and granulated sugar in an electric mixer with a whisk attachment. Whip the egg whites until stiff peaks form. The best way to achieve this is to beat them for two minutes on speed four, then followed by four minutes on speed six. During the last minute on speed six, add your food colouring to achieve your desired colour. Add the dry mix to the egg whites. Using a spatula, smash the dry ingredients into the egg whites to release the air. Then continue to fold the mixture into itself until it becomes shiny (around 25-30 folds). The mixture should resemble a thick ribbon-like texture. Careful not to over mix otherwise you will loose too much air and the mixture will be too thin. Using a large piping bag, pipe around 1 1/4 inch circles onto the prepared baking sheets using your stencil as a guide. Make sure you keep space between them as they will spread. Holding each end of the baking sheet, give them a good slam onto the counter. Rotate and give it another slam to release any air bubbles within them. Preheat the oven to 150 degrees Celsius. Set aside the macarons for 30 mins to form a dry shell top to prevent cracking. Bake each tray one at a time for roughly 16 minutes, rotating the trays half way through. The feet on the shells should stay attached to the top when properly cooked. If not, continue to bake for a couple more minutes. Remove from the oven and allow to cool on cooling rack until room temperature. Place milk and chai tea bags in a small saucepan over a very light flame. Allow to simmer and reduce. The tea bags will infuse the the milk turning it a rich brown colour. Use your Nespresso machine to extract 40ml espresso of Indriya from India coffee. Remove the chai milk mix from the heat and add the espresso. Strain the tea bags and transfer the chai milk mix to a separate bowl to cool to room temperature. Combine room temperature butter and 1 1/2 cups of icing sugar in a mixer until light and creamy. At this point you can add the chai infused milk and coffee to taste. The mixture will look like it doesn’t want to combine at first and may need a helping hand. Add 1 tbs of icing sugar at a time to help it incorporate. Add the remaining icing sugar and beat on medium to high speed to ensure it is well combined. Transfer mixture into a piping bag and fill shells accordingly. Dust with cinnamon and gold dust. This recipe features Nespresso’s Indriya from India Grand Cru. Intensity 10. Shop Nespresso Indriya from India here.